Today, I have to say was a real test of my patience. Both Jasmin and Teyla are on holiday from school so that means that I had 2 handy helpers in the kitchen today while trying to fill an order for tomorrow or since it is 12:51am I should say today! Don’t get me wrong, I love having them around and especially that they have an interest in what I’m doing. Baking muffins? Yes! Making cookies? Yes! 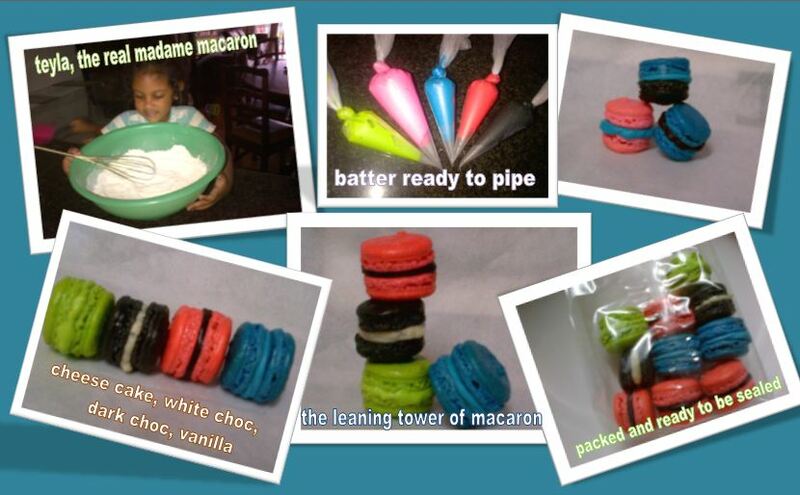 Making macarons? No! The problem with making macarons is this. Although there are only 4 ingredients that are basically needed to make a macaron, there are so so many things that can go wrong along the way and spell disaster. The worst feeling is to spend all that time aging eggs, sifting almond meal, watching the shells rise in the oven and then reaching to pick one of the shells up and having them crumble at your touch because you overworked the batter or did something else wrong along the way and it’s hollow. In the end it did take about double the time that it usually does, but I did complete a batch in 5 different flavours. The dark chocolate ganache I have to admit is my favourite favourite, then the white chocolate, cheese cake ( using an essence), peanut butter and vanilla. I’m doing a bit of experimentation with the macarons and trying out new shapes which should be fun and exciting. Hopefully I’ll be posting some pics of them soon and just in time for Diwali orders:) In the mean time here are some photos of today’s happenings. Sorry about the poor quality of the pics but hopefully I’ll have better resolution next time!